When the volcano blows. . .
"Mariners are advised that the dome of the Soufriere Volcano on Montserrat is approaching the size it was on March 25, 2000 when it last had a major collapse and should keep a safe distance when traversing the area." I listened to this on the radio and looked at the chart where I recently drew our course line from St. Barts to Guadeloupe. It passed about three miles to windward (east) of Montserrat. "We’re going to have to modify this." I thought. "We’ll make this passage on a day when the trade winds are a little north of east, do our best to sail east of the track and bear off to Guadeloupe only when we’re past Montserrat." Actually no one should be in danger to windward of the island, even when close, but there’s no sense in tempting luck. So we set off for Guadeloupe with a mind to keep our distance from Montserrat and it's volcano. It meant that we had to spend the night hard on the wind but when the sun came up Montserrat was well to the west and it was quite a sight. The southern part of the island was an ashen gray and devoid of vegetation. Steam was venting from the top of the volcano. Being on the ocean in a twenty-eight foot yacht can make you very aware of the immensity of nature but adding the sight of an active volcano can make the feeling a bit overwhelming. We passed Montserrat without incident and as it faded in the distance Guadeloupe gradually came into view and grew larger as we approached. It was late in the day when Bellatrix, covered with salt from the hard sail, entered the protected bay of Deshaies. French West Indians like to point out that their islands are not colonies but a part of France much like Hawaii is to the United States. 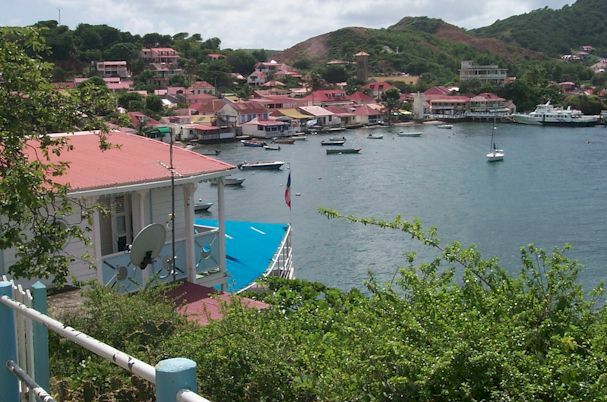 French St. Martin and St. Barts are actually a part of Guadeloupe but their free port status, the cosmopolitan ambience, and many of the inhabitants bilingual between French and English make it hard to realize that you’re in France. Once on Guadeloupe itself there is no mistaking that you’re in France. It’s primarily agricultural with sugar cane being the dominant crop and while tourism is an important activity it’s not well known to Americans. Most visitors to Guadeloupe come from Europe and because of that English is not common. American visitors who do not speak French should try to learn a few words before arriving. With our fractured French and a lot of grunt and point Linda and I got along just fine. Guadeloupe is actually two islands with a narrow river separating them. Each is a separate geological formation. 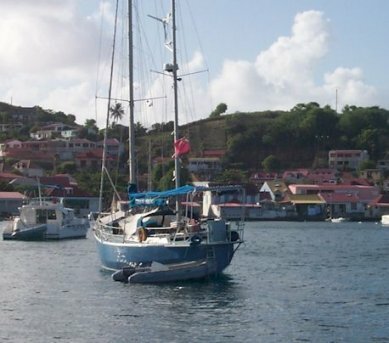 To the east is "Grand Terre" and to the west is "Basse Terre." It’s here where things get a little confusing. "Grand Terre" means "Big Land" yet it is the smaller of the two islands. "Basse Terre" means "Low Land" but it’s the higher of the two islands. High enough to catch moisture from the sky and create rain forests. 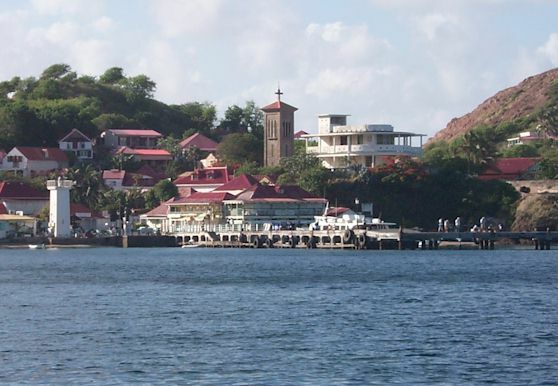 Our cruise of Guadeloupe took us down the west coast of Basse Terre beginning at Deshaies (Dah-Hey) in the far northwest and ending at the small archipelago of Les Saintes south of the main Islands. 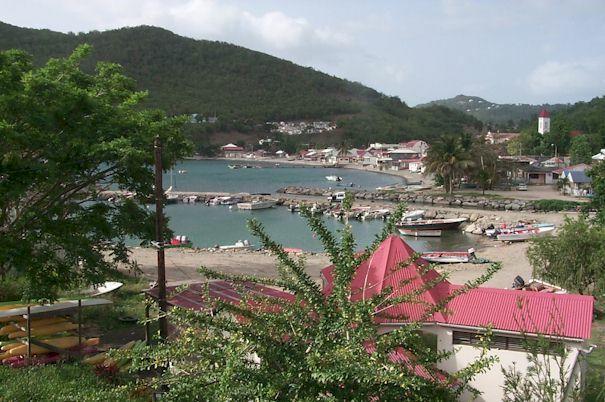 Deshaies is really only a small village that ranges along the shoreline at the head of the bay. From the yacht anchorage the church steeple dominates over a collection of red-roofed homes and businesses making the village quite picturesque. From a yachtsman’s perspective the lack of some services make it not the most desirable place to stop but we found that we could do without some things for a few days in order to linger and immerse ourselves in the local culture. We walked the sometimes-discontinuous sidewalks wedged in between the storefronts and the narrow streets shopping for food, ice, gasoline for the dinghy, and beer. The local bakery was the real discovery. In Deshaies we found life to be the way we envisioned it would be before we set out on our voyage. When we were once again under way we sailed south under the lee of the mountains that dominate Basse Terre. After all the open water passages it was quite a contrast to sail in smooth water. 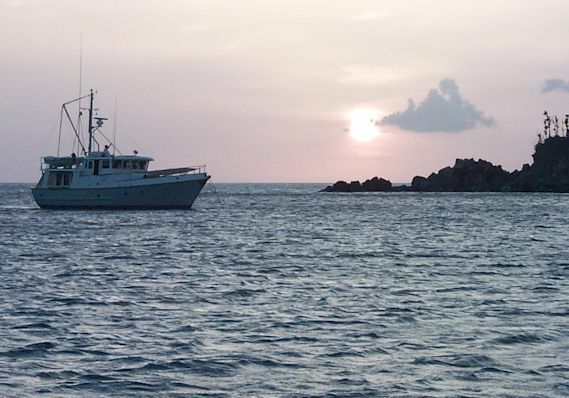 Our next stop was Pigeon Island Anchorage adjacent to the Cousteau National Park. 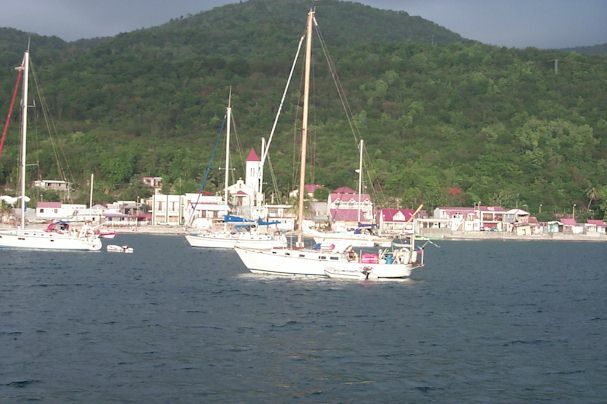 Our objective was to do a couple of dives in the waters around Pigeon Island, which is the big attraction in here. We ended our stay in Guadeloupe at Les Saintes. Due to the northerly swell making the anchorage very uncomfortable we only stayed there one night before pressing on to Dominica. The beauty of the harbor at Bourg Des Saintes is matched by only a few other places in the Caribbean and we regretted not being able to spend more time there. Both Linda and I like Guadeloupe very much even though it’s not the most well known Caribbean Island among Americans. Since Americans are not particularly catered to, landing in Guadeloupe gave us the feeling of really landing upon a foreign shore rather than a place tailored to fit our sensibilities. Occasionally we are asked, "What do you do all day while you’re living on a boat?" This is sometimes asked with the implication that living on a boat has to be boring. It first has to be said that the boat always demands a certain amount of our time so part of each day is given over to boat maintenance. The consequences of ignoring problems can be severe so we always do today what could be put off till tomorrow. Then there are our avocations, Linda with her fiber arts and her new love of drawing and painting and me with my writing and photography. In addition, of course, there is our mutual love for scuba diving. But then there are the reasons why we are voyaging in the first place. Certainly to satisfy our spirit for adventure but more so to immerse ourselves in different cultures in a manner not available to someone who has flown in on a two-week holiday. Bellatrix is our home and, since it’s a sailing yacht, it can be transported to a new "neighborhood" regularly. We become temporary residents of each place we visit forcing us to procure the necessities of life in the same manner as the locals. So much of each day is dedicated to walking about a new village or town searching for the staples of life. Most of the time we find what we need but it’s almost never exactly what we would find at home. This can be frustrating but, since it forces us into the local way of doing things. it is more often an enriching experience. This is most evident when shopping for food. The markets are filled with foods that you’d never see at home and a little sense of adventure can lead to some wonderful discoveries. There have been some blunders. When lifting the wrapping off a cheese that I’d bought in Marigot, St. Martin I knew immediately I’d made a mistake. But then there was the bakery in Deshaies, Guadeloupe that sold bread baked in a wood-fired oven. We’ve never had better. The vegetable bins can be filled with unusual, sometimes frightening, selections but we say to ourselves, "It’s not killing the locals so go ahead and try it." This always leads to more cultural interaction since we have to ask, "What is it and how do you cook it?" People are almost always delighted to enlighten a foreigner about something unique about their culture. So, by the time we’ve done our boat chores, kept our musical skills sharp, followed our avocations, and had our daily dose of local culture it’s time to kick back in the cockpit and watch the sunset. We feel we have very full lives.